Tastemade has had quite a year. The company, known for its quirky short-form videos about food, travel and lifestyle topics, hit the 100 million monthly active users mark, with more than 1 billion monthly views. On Facebook alone, Tastemade grew its audience from around 100,000 fans to more than 5.7 million. This year, the company joined Apple TV—the only food and travel channel on the platform—linked up with Facebook's Anthology and Suggested Videos, partnered with Spotify on the streaming music company's video service, and landed one of the 15 prized spots on Snapchat's Discover platform. As Tastemade, which was founded in 2012, heads into its fourth year, it will do so with deeper pockets. The video publisher announced this morning it has closed a $40 million Series D funding round led by Goldman Sachs, with participation from existing investors Redpoint Ventures, Raine Ventures, Comcast Ventures, Liberty Media, Scripps Networks Interactive, and Tohokushinsha Film Corporation. 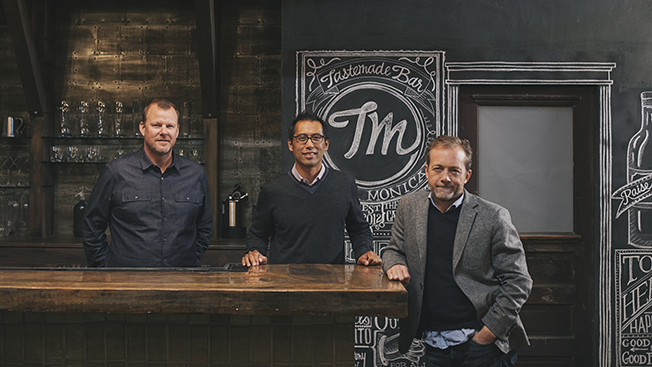 Tastemade had previously raised $40 million, bringing the total funding to $80 million. With the extra cash in hand, Larry Fitzgibbon, one of Tastemade's co-founders, wants to continue Tastemade's momentum, especially when it comes to working with brands. "All of that work has culminated into us reaching the exact consumer we thought we would at a scale we thought we would as well," said Fitzgibbon. "We are truly becoming the brands for our categories for that audience." Fitzgibbon noted that Tastemade's advertisers have a growing desire to appeal to that young, millennial, mobile-first audience. And he argues that its approach in working with advertisers—either through sponsored episodic series or social media influencers—is working. Tastemade recently released its latest sponsored series with Italian beverage brand San Pellegrino called Heritage, which explores the backstory of some of the most brilliant chefs around the country. Fitzgibbon said that compared to more traditional forms of advertising such as TV buys or pre-roll ads on YouTube, Tastemade videos outperform on key aspects such as purchase intent, likelihood to recommend and authenticity. "We beat out those other forms of advertising pretty handily," he said. "We certainly want to do more of it. We know it's working." Now that the brand is on Apple TV, Snapchat, Facebook, Spotify, YouTube and, of course, its own website, Fitzgibbon said next year's focus will be on tailoring its content to each platform. "Creating the programming as well as distributing that programming is increasingly getting more complex," he said. "A lot of brands are faced with that same reality: 'How do I create either advertising or content and help distribute it across this increasingly fractured media world?'" Fitzgibbon wants to put some of the new money towards expansion, noting the West coast-based company recently opened a new sales office in New York. "We're very pleased with what we've seen based on that investment," he said. "Part of the thinking behind this most recent round of funding is to invest in that even further."